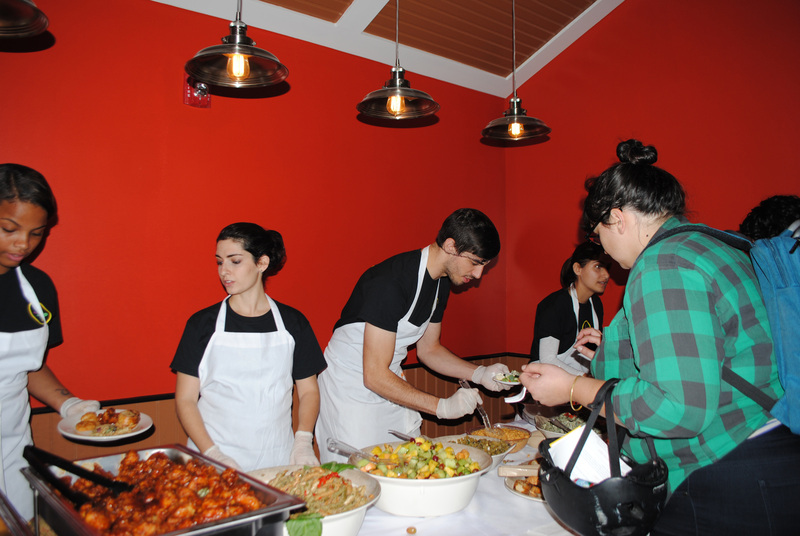 EAT Cafe opened its doors as a full-service, pay-what-you-wish restaurant Oct. 26, at an 11 a.m. ribbon cutting ceremony. EAT Cafe is the first of its kind in the area. Situated in the middle of seven West Philadelphia neighborhoods, including Powelton Village, Mantua and University City, it is surrounded by food deserts — areas where nutritious, healthy food is hard to find and even harder to afford for the low-income families that make up much of the population. The idea for EAT Cafe started about five years ago, when Mariana Chilton, professor at the Dornsife School of Public Health and director of the Center for Hunger-Free Communities, learned about Brazil’s zero hunger campaign. She discovered that restaurants and cafes were opening in Brazil where diners could come and enjoy a healthy meal, and pay only what they were able. She wanted to see this idea in the United States. When she began doing research, she found that some of these establishments already existed within the country, but none were in Philadelphia. This was the birth of EAT Cafe. Now, five years later, and four years after receiving seed money to begin the real work on the project, the restaurant is open. Diners can order from a three-course menu, be served and treated with respect and courtesy and pay a suggested bill however they see fit. Diners have no obligation to pay any amount of the bill. Those who are able are encouraged to pay at or more than the suggested price to help cover the cost of a meal provided for someone who could not afford it otherwise — the concept relies on diners paying it forward. “It’s not going to end hunger. But, it creates community and it’s a place if you want to come, you can eat with a sense of joy and no chains,” Chilton explained. “They don’t have to prove anything, they don’t have to say anything, they don’t have to demonstrate need, just come and eat. Pay what they can. If they can’t pay anything, that’s wonderful and fine, and I hope other people come and pay a hundred dollars,” she continued, laughing. Across the country, other restaurants like EAT Cafe do not offer as much of an open environment. The restaurant did have some setbacks while opening, and the projected opening date was pushed back a little over a month. EAT Cafe manager and CFHFC member Donnell Jones-Craven, however, didn’t seem worried about this at all. “Opening a restaurant is always full of challenges, all the way up to the ninth hour, but the main thing is to maintain your focus, communicate as much as you can and work through the process. It kind of came together for us,” he explained. Everybody at the open house had great things to say of the cafe. 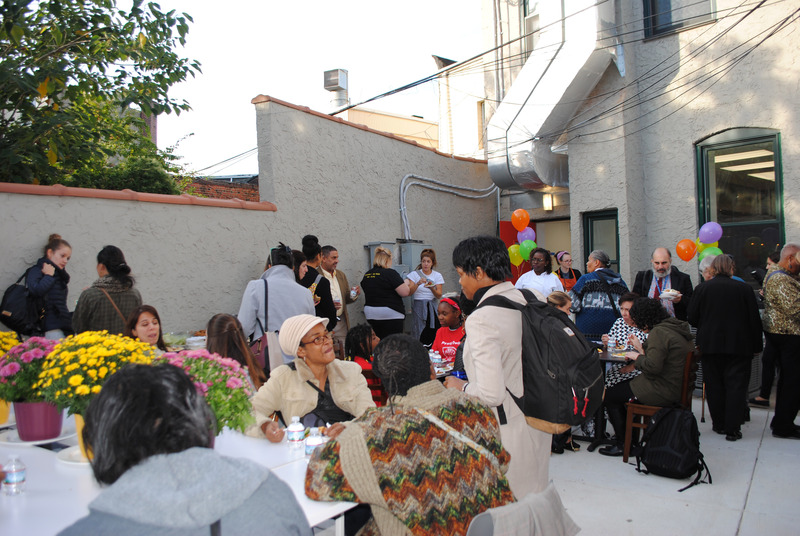 Community members were seated indoors and outdoors, enjoying small plates of food around huge, family-style tables, chatting, laughing and enjoying the weather and the community atmosphere. Next to the kitchen, staff members and volunteers were serving up crudites, fruit salad, fresh bread with 3 dips, pasta salad and fried chicken both with and without sauce. Outside were cakes, cookies and fresh fruit. Chef Derek Wilks stood behind the barrier between kitchen and restaurant, chatting with diners while sending a booming laugh down the hall. “[The kitchen] brings a smile to my face. It’s like a home,” Wilks explained. He expressed how excited he was to be working at the cafe, and how much he loved the open kitchen and the connection it made between the diners and the chefs. Wilks explained that the process to be hired was just like that for any job. “You had to get hired, just like a Drexel employee, go through a background check, fill out an application, go through the whole process,” he said. Food is obviously the central theme to EAT Cafe. In a region devoid of nutritious and affordable food options, providing wholesome, healthy food in an affordable and respectable manner is incredibly important. “One of the things that we’ve learned from our research and our programming is that food is just essential and a part of everyone, every community, every family. Food is a central thing. One of the things we’ve been doing for a long time is trying to bring community back and trying to unite everyone around food, and a place to eat, no matter what walk of life they’re from, and EAT cafe does that,” CFHFC member Falguni Patel explained, while helping out during the open house by serving cake and chatting with community members. EAT Cafe community engagement and communications fellow Callie Perrone was also at the open house. Her job focuses less on food, and more on the community. Perrone helped organize and coordinate the cafe’s advisory committee. The advisory committee is made up of eight community members, each a representative of one of the neighborhoods serviced by the cafe. The committee regularly attended meetings with EAT Cafe representatives to help decide on many factors which influenced the Cafe, all the way down to the name, color scheme and vibe of the restaurant. Perrone will also help coordinate community outreach events that can be hosted in the Cafe with the use of a small stage at the front of the restaurant. “The space is intentionally able to transition into a performance space so we could have spoken word nights, a jazz artist… We want to be able to, being a community cafe, be able to highlight the community’s talents,” Perrone explained. The performance space aspect of EAT Cafe brought up the question of coordinating events with Drexel students. “One of the many points of the cafe is to bridge that gap between University City and West Philadelphia and give a space where people can really connect,” she explained. “This is not a for-profit type of restaurant. It’s really for the community and by the community,” Patel added in agreement. Another one of the ways Drexel students will probably be able to connect to the cafe in the future is via the co-op system. While the cafe is non-profit and would likely not offer “traditional” restaurant-based co-ops, there are several avenues for business or public health positions students could likely be a part of. Chef Richard Pepino, the executive chef of Drexel’s Center for Hospitality and Sports Management, made an appearance at the open house to see the finished restaurant space. Though not directly involved, Pepino has worked a few times with Jones-Craven at Dornsife community dinners and in general to help get the word out about EAT Cafe. “I think this is amazing, I really do. Seeing everything that I’ve been a part of in the last two years since I went to the Center for Hospitality and Sports Management and what I’ve done with Dornsife Center, with the side-by side classes, the community meals, looking at this, this is wonderful,” Pepino stated. He went on to say that while nothing is official yet, he imagines co-ops at EAT Cafe will definitely be on the table for discussion, and opportunities for student involvement will likely be explored in the future. The entire place was packed for the open house. One family was eating outside and enjoying the fall weather. Ben Rhoades and his family have lived in Powelton Village but currently live in University City. “This has been ongoing for months and months and seems to be taking a little longer than expected, but we saw a line with this opening today and we decided to come down,” he stated. Rhoades, like many of the patrons attending, said he was totally blown away by the unexpectedly beautiful aesthetic of the interior and exterior of the cafe. “I don’t know how well or not well it will address the needs [of the community] because I don’t know if the people who need it will come. I don’t think it’s going to hurt the community, I think if anything it’s going to be a good business and a good neighbor and good for the area as a whole,” Rhoades commented. The cafe will be open for service Wednesday through Saturday from 4:30 to 8 p.m. Jones-Craven is excited to get started. “I’m excited to see how it’s going to start working. We’ve got a pretty good staff, and the staff has been together for a little less than a month and so we’re learning each other which takes time, but we’re looking forward to really doing a good opening, and just keeping everything simple in nature the best that we can,” he stated. All patrons are welcome at EAT Cafe, and students are encouraged to check it out. For more information on how to support the cafe, visit www.eatcafe.org.